Peyos and the power of identity. A hasisd boarded a plane and took his seat next to a woman who, as it happened, was also Jewish. After squirming in her seat quietly for several minutes, she turned to him with a scowl. “Jews like you,” she said, “you give the rest of us a bad name.” She then felt comfortable to go on and on about how shameful it was that hassidim dress the way they do in a modern world. A look of horror crossed her face. She apologized profusely, tripping over her own words as she professed respect for the Amish and their ability to maintain their traditions through the years. There is much to comment on here, not least of which is the woman’s outrage only when she thought her seat companion was a traditional Jew. Our clothes can either mask who we are or announce our true selves to the world. The Midrash says that when we were slaves in Egypt, among a very few cultural expressions, the only thing keeping us from assimilating into Egyptian society to the point of vanishing was our dress. It is also worth noting that, in the woman’s diatribe about the hassid’s “refusal” to engage in the modern world, she failed to recognize her seatmate was the world-renowned Rabbi Abraham J. Twerski, M.D., founder of the Gateway Rehabilitation Center, a man who has written tens of books dealing with modern psychology and personal growth from a Jewish perspective. Clearly, in his case, his clothes had less to do with being “behind the times” than being a direct expression of who he sincerely and truly is. That is, the halakha is clear that it is asur (forbidden) to raze, or destroy peyos. It is also clear that there is no mitzvah to grow them. Few things speak to how powerfully appearance and spirituality express themselves in some religious Jews than peyos. To those who grow them, they are singular in their expression of piety and devotion. It is not much of an exaggeration to say that their peyos define them. Peyos. They are signs. They are witnesses. Simanim. They are signs that clearly identify who and what the boy or man with them is. They proclaim, I am a Jew. I am not a slave. I am not a Muslim. I am not of this world, even if I am in this world. I am a Jew. And the longer the peyos, the longer the time devoted to that holy distinction. What then of the Jew who, because of illness, loses his peyos? To the non-Jew, such a loss might be dismissed as insignificant. Even to other, less observant Jews, the loss might not strike at the heart of Jewish identity. But to the observant Jew who has moved through life with those two signs, with those two witnesses… it is an essential loss. It strikes deep to observance and identity. More than something physical is threatened and lost. There is a sense of loss of something essential to his identity. Mrs. Fisch sees the children afflicted by serious illness and their parents all the time. As if it is not devastating enough to have a child with a serious, perhaps life-threatening, illness she sees face to face the hurt in parents’ eyes, and of loss in her young patients’ eyes, when they confront the loss of their peyos. The parents pray for healing first and foremost. They do not want to lose their precious child. Likewise, they do not want to lose their child’s identity. Once the immediacy of the medical care is over, it is so important for the patient and his family to get back to “normal”. And, for them “normal” means to have their “witnesses”, their identifying simanim. Peyos speak to who you are and where you belong. Patients are desperate not to lose their sense of belonging, of being a part of all of us. Especially when so much else has been taken from them due to illness. Their peyos are a statement that they are still part of klal Yisroel. How then to “give back” to these patients that which has been taken from them? As we have we noted, they cannot be regrown “overnight”. Likewise, because of disease or treatment, they might not be able to be regrown at all. They must be created to be given back. It takes a very special artist, a very special soul to accomplish this humane, this divine act of giving back. I have been blessed to be able to observe just such an artist at work. My wife, Clary, is one of the finest wig designers and manufacturers in the Orthodox community. Gorgeous shaitels are one thing. The greatest challenge she faces, the one she finds most demanding and most sacred, one that weighs on her so that she feels “drained” when she is done, is the need to create peyos for these desperate families and patients. Dr. Cheryl Book, Director of Clinical Services at Chai Lifeline, internationally renowned chesed organization meeting the needs of the sick and their families, understands well the challenge – and reward – of working with these heartrending cases. Whenever Chai Lifeline is confronted with cases of illness of children in the Chassidic community who have or inevitably will lose their peyos, they contact Clary’s to urgently get the peyos. In many cases, Clary’s son, Chaim Ben Zion, who serves as manager for Clary’s business, will go to the hospital as soon as he can to accurately assess the specific need, measure the head with a yarmulke and make sure every appropriate preparation is in place to allow the peyos to be as perfect as possible. Chaim Ben Zion too shares Clary’s sense of purpose. “... that I can do something so huge for the family and the patient... seeing someone helpless, not knowing what to do next... and then I come and am able to ‘make him happy’. It takes so little to make someone happy. Not always do I get to see their happy faces after they get their new peyos but at least I know I did my very best. That she and those she works closest with always rise to the challenge speaks to more than her artistry. It speaks to her neshama and how that neshama influences everyone around her. Clary conceives, designs, creates and “builds” each pair of peyos with loving attention and devoted care. With each, she contemplates and envisions the precise peyos twist, curl, movement and shade of hair color. “Making a pair of peyos is always a challenge… [but] seeing their smile return when their peyos are back ‘on’ is an indescribable satisfaction. Not always do I get to see that inevitable smile. No matter what, we will always give priority to making the peyos before anything or anyone else. They need to look like always... they need to look like themselves... Can you think of a greater priority?! 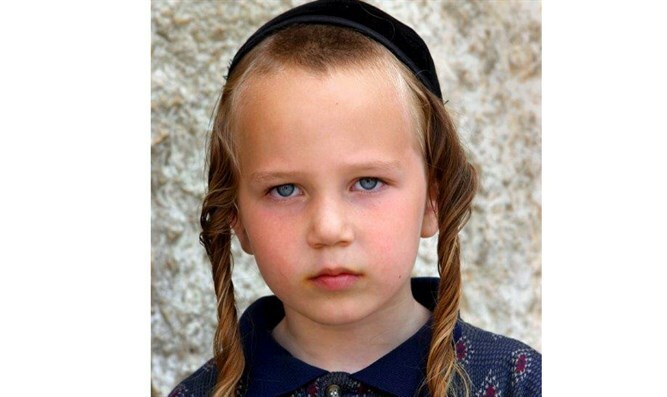 Is there anything greater than to return to a Jew his identity and his sense of worth and belonging as a Jew?